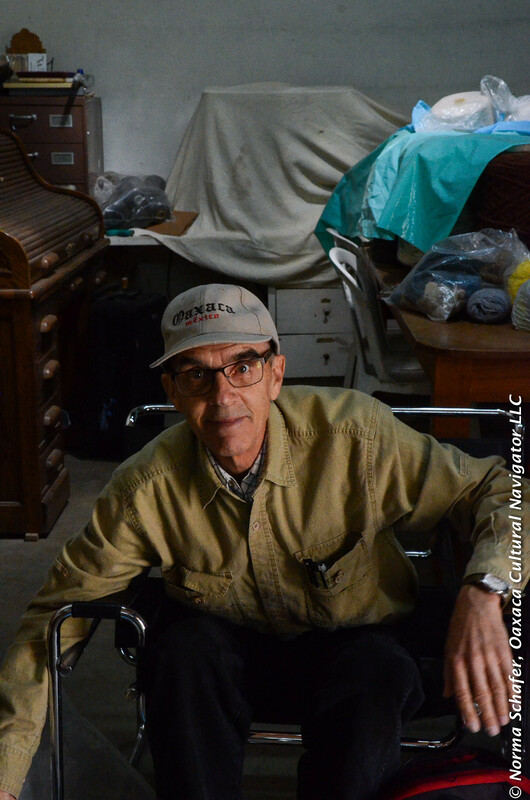 In 1996 Englishman Graham Johnson came to Ocotlan de Morelos from Mexico City to open a woolen mill. The mill was designed to streamline the production process for making yarn and weaving cloth from local churro sheep wool* without sacrificing quality. Graham was a tinkerer. He loved machinery, especially the old carding and spinning machines that were being replaced by computerization. 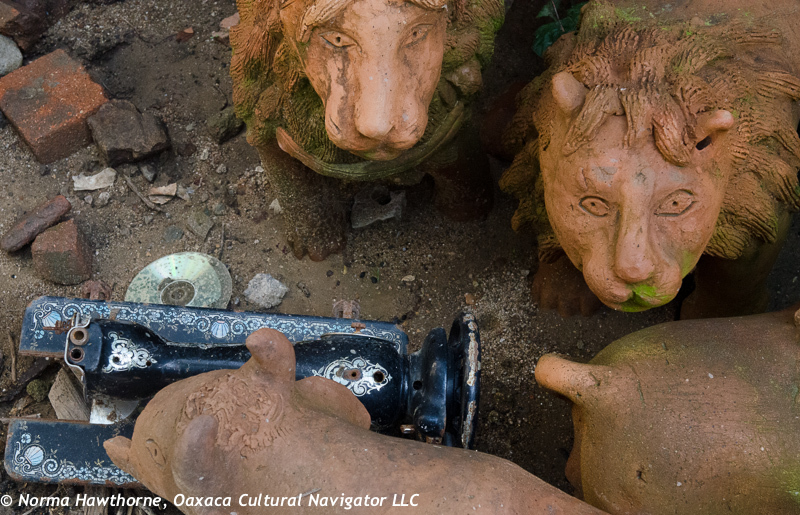 He bought these up, shipped them to Oaxaca from the United States and the United Kingdom, and refurbished them. Often, he would find or make the parts to keep them going. Many were 30 and 40 years old already. 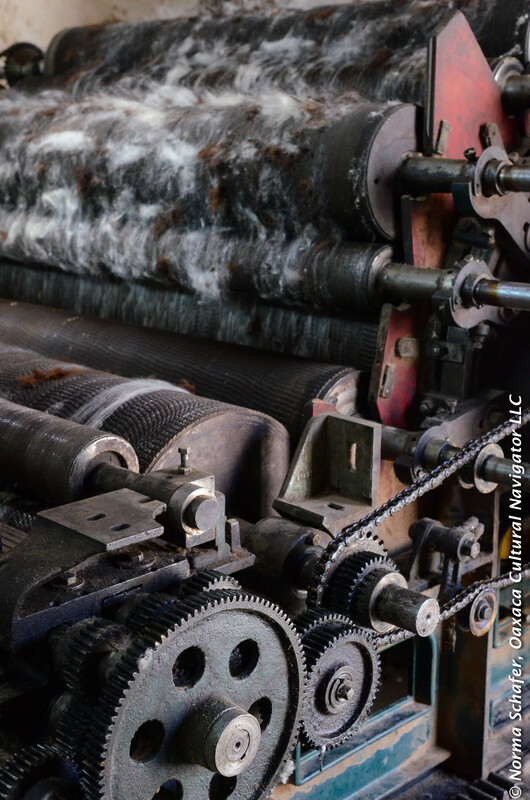 Over time the mill diversified and made luxuriously soft merino bed blankets and throws, fancy yak hair mecate horse reins, cinch chord for saddle belts, colorful wool tassels to decorate saddles, horse blankets and rugs for home decor. They kept a supply of all types of wool to work with and blend, continuing to experiment to produce soft and durable products. 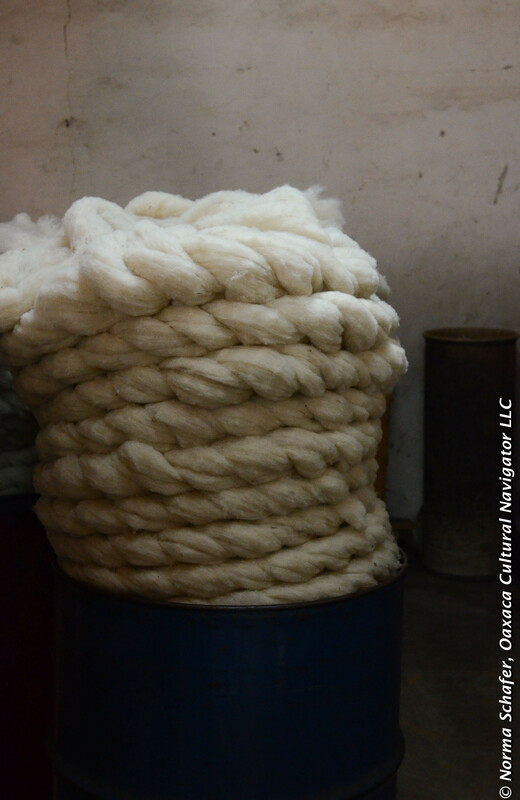 In addition to merino, the mill cleaned and spun cashmere, mohair, Lincoln and other breeds. They still do. Then, Graham died suddenly from a heart attack in 2009, and there was a question about who would keep the business going. I remember when I first met Graham on one of my early visits to Oaxaca. It was probably 2005 or 2006. The mill was running at full capacity and you could hear the hum of machinery as you walked down the open corridor separating the rooms where the work was done. It was impressive then what these old machines and talented local employees could do. 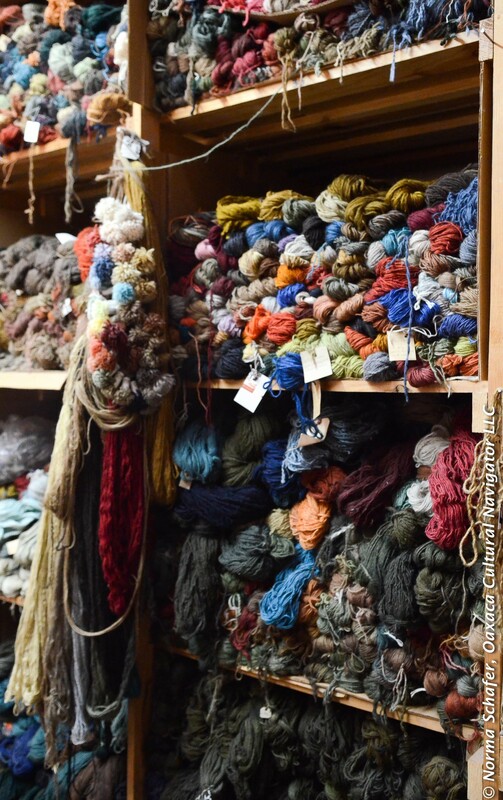 Now, when I revisited with my friend Scott Roth, who has been working with weavers, wool, dyes, and the hand-loomed rug weaving process for over 40 years, I could see the changes. Scott brought with him replacement parts for some of the machines. Machines that were working ten years ago now need repair. Old belts, bearings, wires, cogs and wheels break, wear out. For the past two years, Graham’s 37-year old daughter Rebecca has stepped in and is learning the operation. The mill is 25 years old and Rebecca is determined to keep her father’s dream alive. At her side are Rosalba (Rosie) Martinez Garcia, who has been there for 18 years and knows just about everything about the mill. Helping are Angel Laer Ambocio Perez (above) and Alejandro Maldonado Santiago. They know a thing or two, too, although their tenure is much shorter. Rebecca loves textiles. She loves yarn. 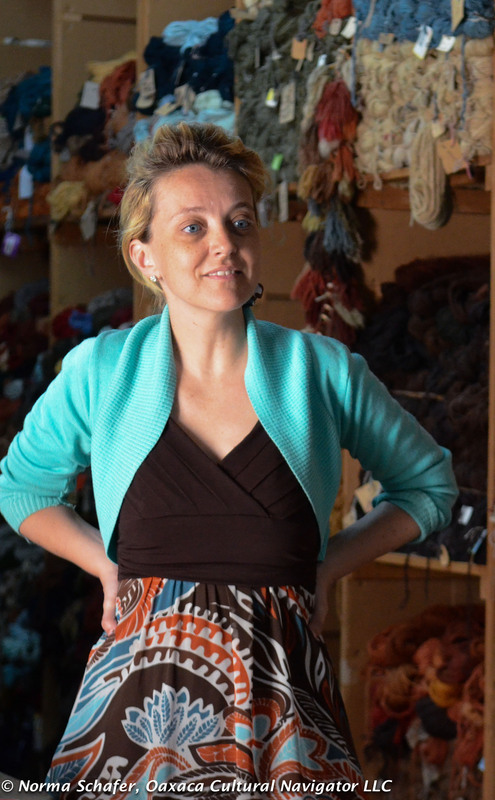 She wants to supply all types of yarns for knitting and weaving and other fiber arts. 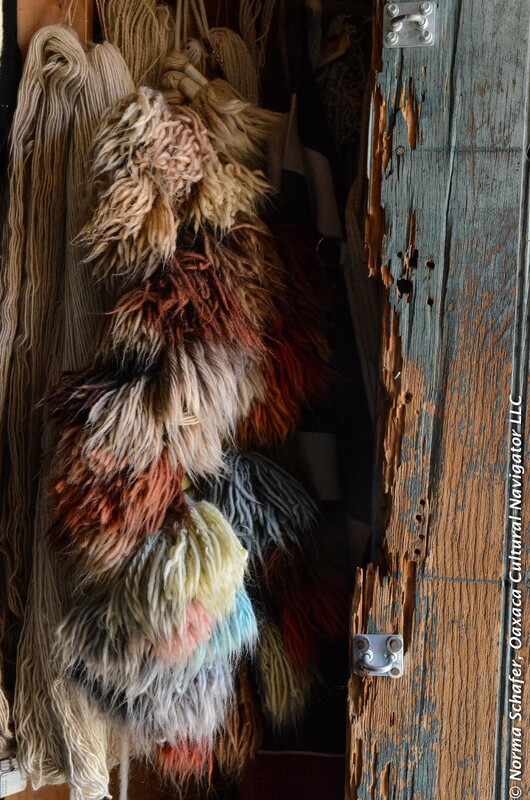 There are beautiful rugs and blankets stacked on shelves that were made before her father passed that are for sale. Spare parts for anything is essential here in Mexico. Equipment can be old. It can still be good, functional, valued. If one has the necessary parts to keep it going. Graham wasn’t the only tinkerer here. 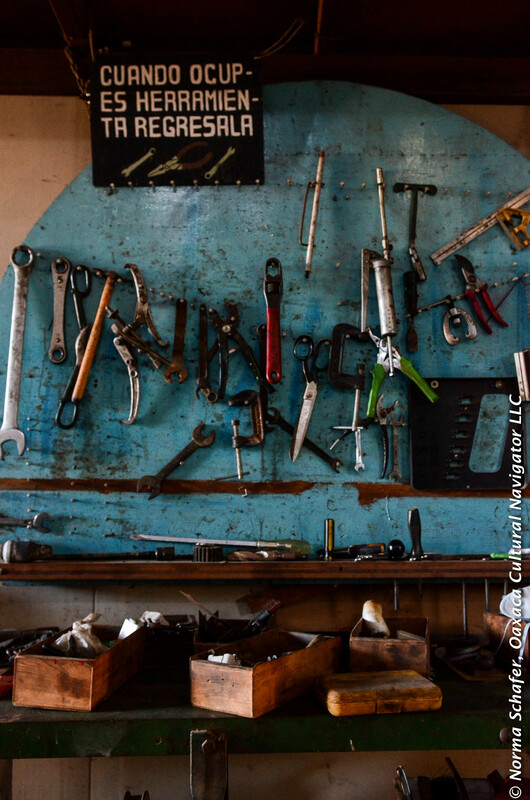 People save, cobble together, recycle, repurpose. Things get jimmied together and continue to work. People here learn how to be resourceful with what they have. It’s something I’ve learned being here. As Scott and Rebecca worked out numbers to complete their transaction, I wandered the mill, remembering Graham. A cat ran across the corridor to hide. 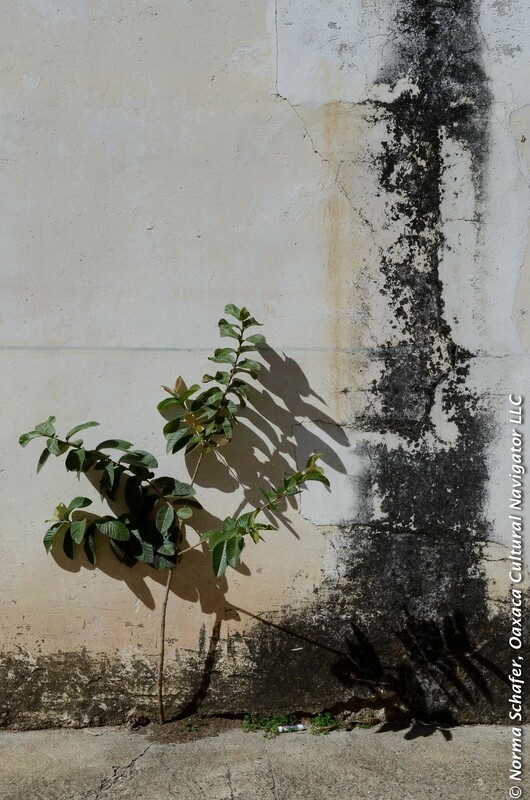 A young tree struggled to grow up from the crack in the concrete. 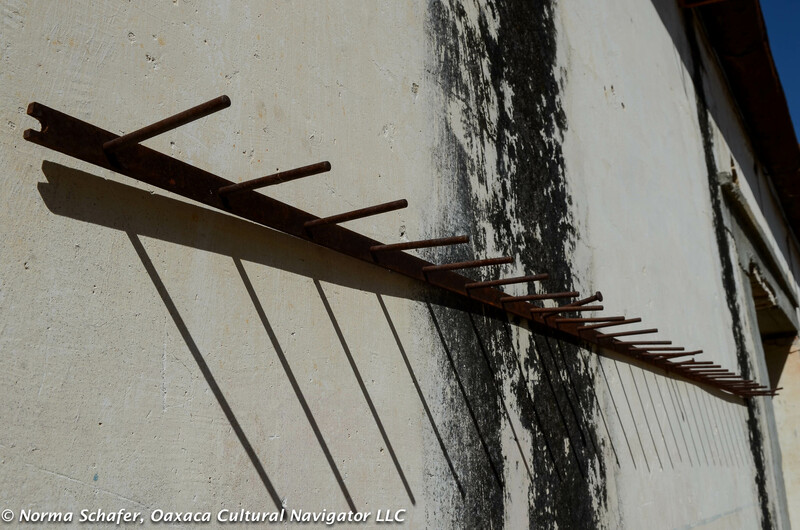 A rusted yarn holder cast shadows on the adobe wall. 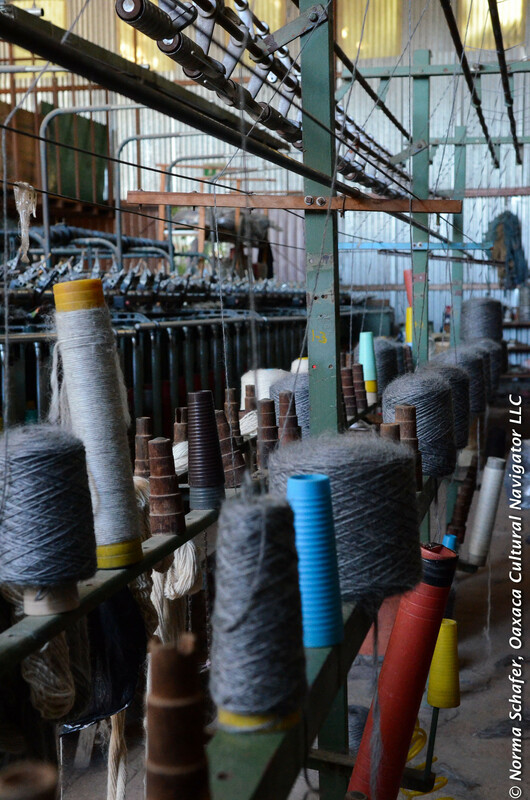 I loved being there, another part of the textile heaven that is Oaxaca. 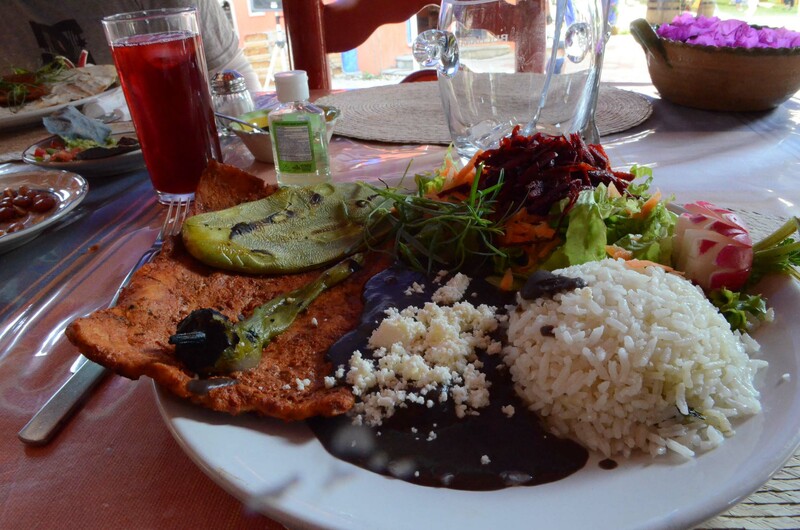 Where to Find It: Lanera de Ocotlan, 119 Benito Juarez, Ocotlan de Morelos, Oaxaca, Tel: 951-294-7062. Email: Rebecca Johnson at becky_madonna@hotmail.com for an appointment to visit. 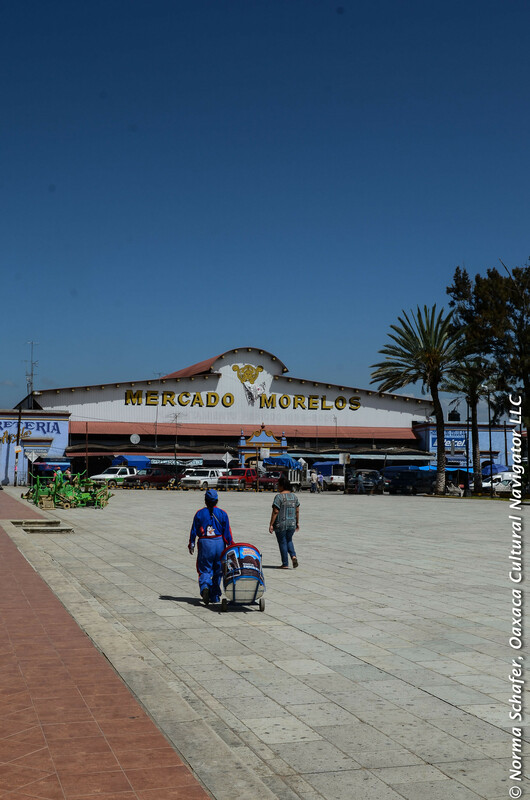 Directions: Continue straight past the Zocalo and the Mercado Morelos two blocks. The wool mill door will be on your left. It is unmarked. Footnote: *Local wool is shorn from churro sheep which were brought to Mexico by the Spaniards with the conquest in 1521. The sheep are raised in the high mountains above Ocotlan in San Baltazar Chichicapam. The mountain range separates the Tlacolula and Ocotlan valleys. The altitude there produces a soft, dense fleece. 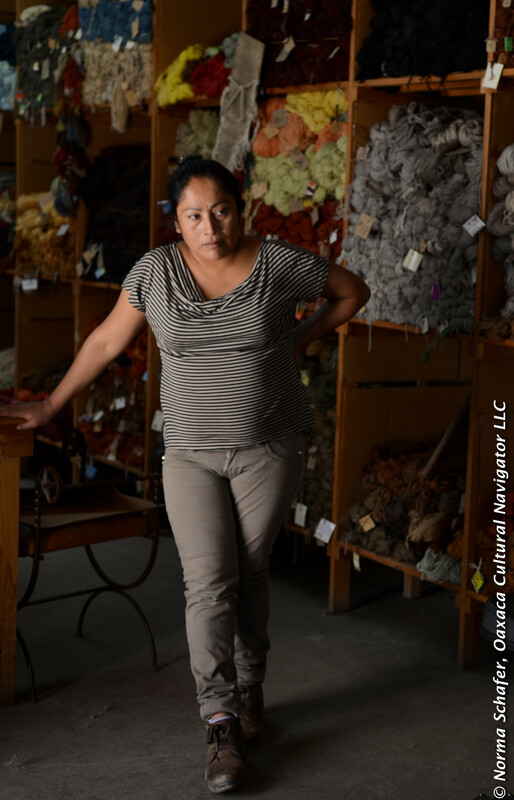 There are still some, like Yolande Perez Vasquez, who use hand carders and the drop spindle to produce the best yarn, but this is a costly, labor-intensive process that yields a premium yarn that is very dye absorbent. Few weavers are able to pay the price. 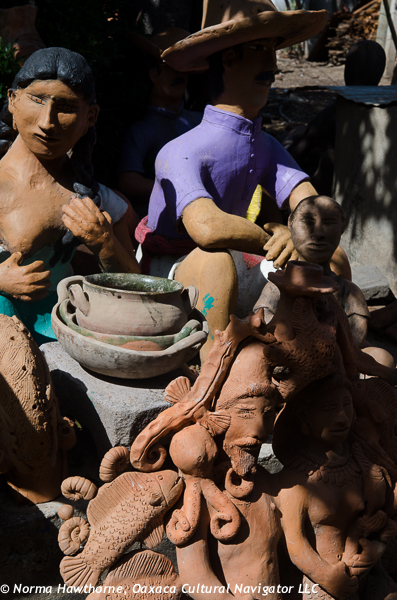 Jose Garcia Antonio, one of Oaxaca’s best clay sculptors, participated in the 2014 International Folk Art Market in Santa Fe, New Mexico, this July. This is no small accomplishment. This juried exhibition invites only the most accomplished artisans from all over the world to show and demonstrate their craft. Last Friday, we drove out to San Antonino Castillo Velasco as part of an all-day excursion to celebrate my friend Carol’s birthday. She wanted our first stop to be with Don Jose. It’s dark inside the studio, atmospheric. 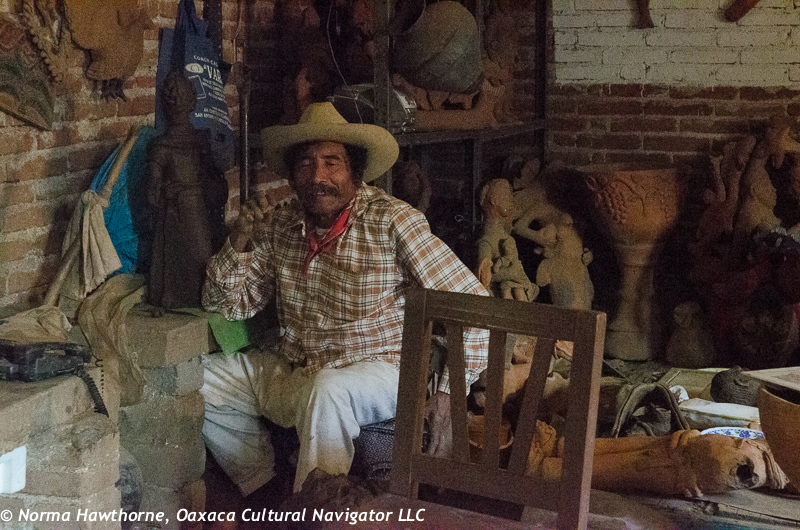 Don Jose works intuitively, feels the clay, feels his wife’s face, the faces of his children and grandchildren. He inspires creativity for those with physical limitations. While we were there, he received a call from TV Azteca in Oaxaca. They wanted to come out to interview and film him that afternoon. He is becoming very famous. I remember going to his studio years ago when not many knew about him and he was far off the beaten path, long before tour guides had him on their radar to bring clients there. I remember when we drove into the entrance of San Antonino and inquired from a moto-taxi driver if he knew where Don Jose lived. We paid the driver 10 pesos to lead us there. 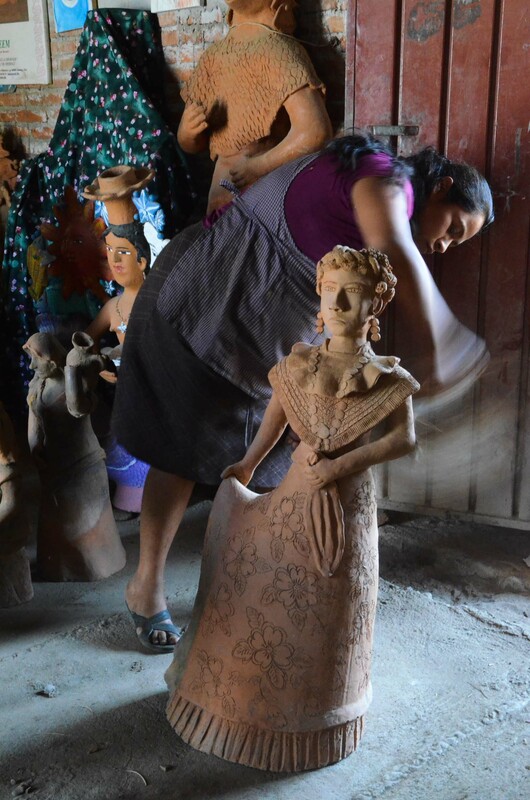 I remember when I bought a life-size figure of a Juchitan woman carrying a basket on her head, hips swaying, braids hanging, skirt flowing, knowing she was too heavy to ever bring back to the USA, and putting her in the home of friends until the Oaxaca home I was to live in was completed — years later. Each time I visit Don Jose Garcia Antonio, I am amazed how his magic hands inspire and create work his eyes cannot see. Each time, I am tempted to add something to my collection. This time, it was a pig planter, which my travel mates called Wilbur. His daughter, Sara, makes expressive clay face-mask planters to hang on a wall. All the children work the clay. The grandchildren are growing up in this clay culture, shaping simple figures of butterflies, mermaids, and winged angels. Small treasures to pack into suitcases to remember the artist, his family and the experience of being in the arts and artisans mecca of Oaxaca. 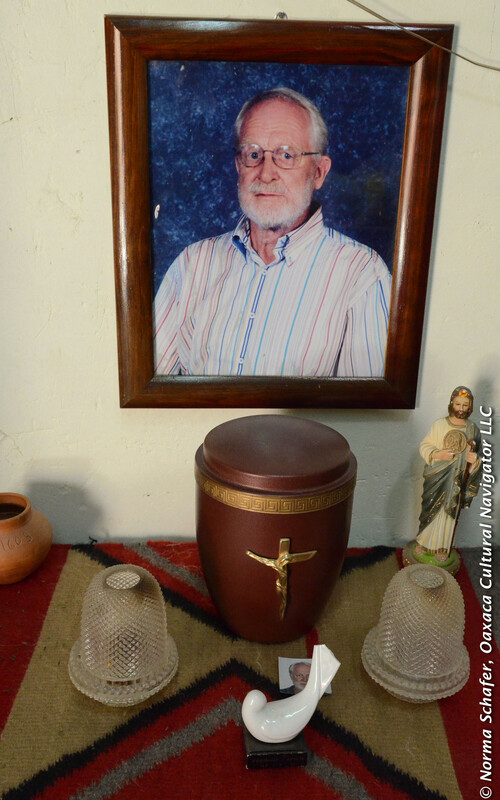 How to Find Jose Garcia Antonio: Turn into the village of San Antonino Castillo Velasco. Turn right on Calle Independencia. Turn left at the first street. Go several blocks. Look on the left side of the street for the clay lion on the roof. There you are! 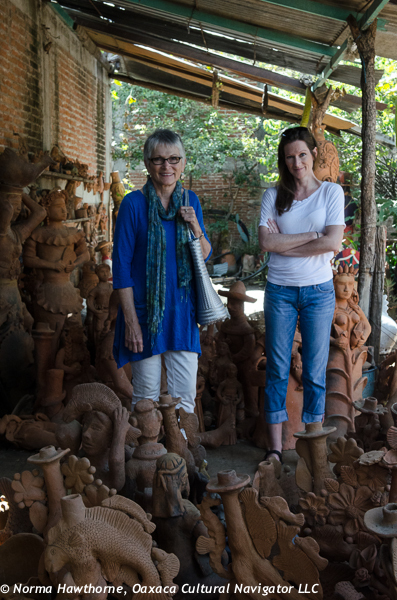 My sister and I set out for San Antonino Castillo Velasco, Oaxaca, to visit the potter Don Jose Garcia Antonino who makes life-size human figures sculpted from local red clay called barro rojo. We decided to go before everyone arrived for the wedding so that we could focus on the shopping day at hand. Barbara has been wanting to get one of Don Jose’s sculptures for years. She was set on getting one she could see eye-to-eye with. Yes, they are that big! San Antonino is mostly known for it’s intricate multi-colored embroidery with designs of flowers and birds that embellish blouses and dresses. The quality and amount of the embroidery plus the finish work determine the price of a garment that can range from 200 pesos to 6,000 pesos (that’s about $17 USD to $525 USD). The white on white version is known as the Oaxaca Wedding Dress. Here at Artesanias Viki on Calle Libertad No. 1, (telephone 571-0092) sister Barbara models a manta (natural cotton) blusa with hot pink embroidery on the bodice. 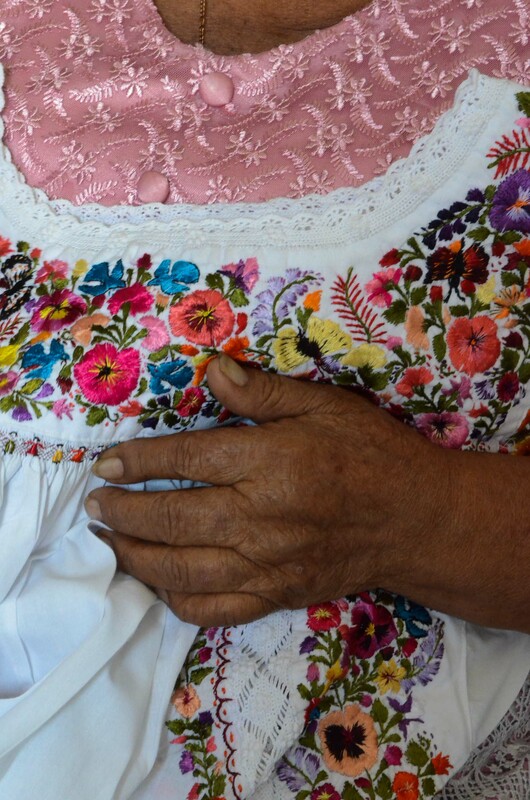 Dueña Virginia Sanchez de Cornelio and her daughters, also included in the Grand Masters of Oaxaca folk art book, have a stash of stunning blouses and dresses in all types of colors, sizes, intricacy of embroidery, and prices. Note the pansies and the little figures that make up the smocking on the bodice of the white dress. These can take six to nine months to embroider, we are told. We probably spent an hour or more at the pottery studio and then a good hour-and-a-half with Señora Viki trying on clothes. Good thing we did this trip sola — just the two of us. After a lunch on the patio at Azucenas Zapoteca at the San Martin Tilcajete crossroads, we went to Mailboxes Etc. 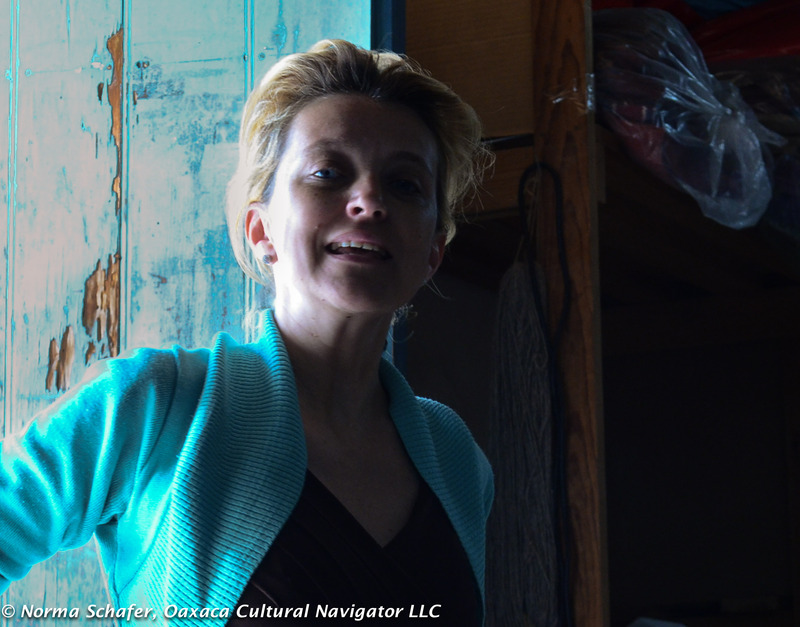 in Oaxaca city to pack and ship the girl, which Barbara nicknamed Viki! 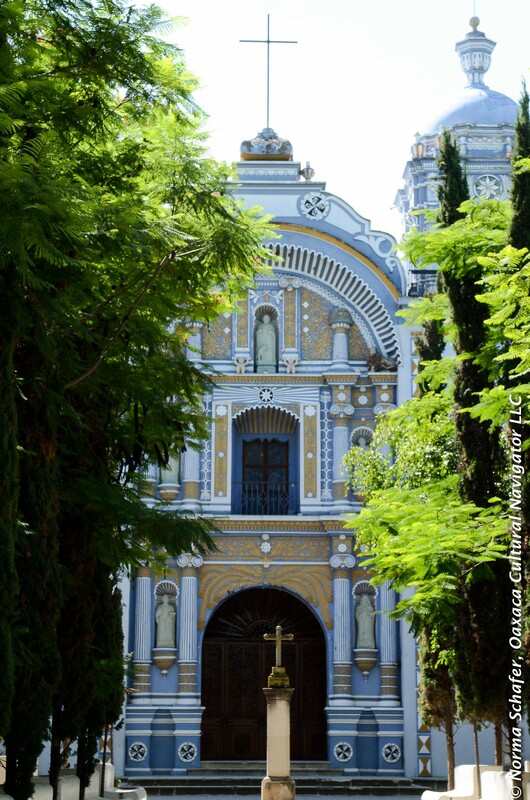 San Antonino is just before you get to the town of Ocotlan de Morales, about 40 minutes beyond Oaxaca on the way to Puerto Angel. There’s a sign that directs you to turn right off the highway. 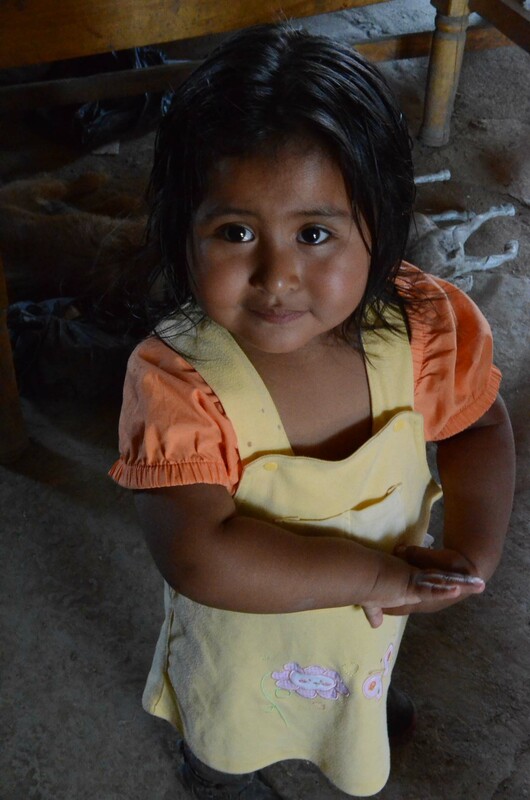 It is beyond San Martin Tilcajete, the alebrijes village and Santo Tomas Jalieza, the backstrap loom weaving village. You can make a day of it along this route. Hire a taxi for 120-150 pesos per hour or take a collectivo for 10 pesos per person each way. Our mode of transportation was trusty Teotitlan del Valle Sitio Zapoteco taxi driver Abraham. Running errands later in the day, we hopped on a moto-taxi which we call a tuk-tuk. 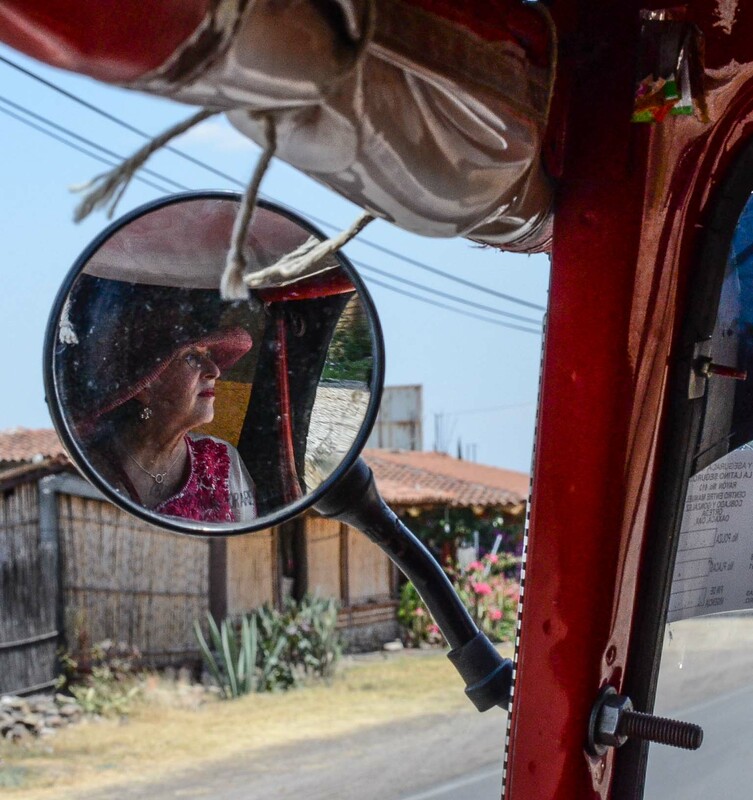 Here’s a bit of pueblo scenery with Barbara profiled in the rear-view mirror! Fortunately, I downloaded these into my computer before I lost my camera, so I’m able to share them with you. Hope you enjoy. Sheri picked us up in her white van at the pre-determined 9 a.m. hour, early by Oaxaca standards, though the streets were already abuzz with honking vehicles. Our first stop was the ATM (exchange rate 13.12 pesos to the dollar) to stock up again for the day long adventure down the Ocotlan highway. We passed the airport and headed south along the valley highway that leads to some incredible crafts villages, stopping for gas at Pemex the state-owned oil company. The earlier the better along this road because the Ocotlan market attracts people from throughout the region whose motivations are to shop for the sheer pleasure of it or for survival needs of buying and selling everything from oilcloth table coverings, hammocks, woven baskets, pipes and gaskets, kitchen utensils, leather belts, children’s plastic shoes and everything else under the sun, including live turkeys raised for market, feet bound in twine so as not to escape. The van boasted New Mexico license plates, a good fit for around these parts, although vehicles are brought down from every state in north America to be bought, sold and traded. We circumvented the hubbub, stopping first at the three Aguilar sisters whose shops you might miss if you didn’t pay attention. They are on the right side of the road heading into Ocotlan, about three blocks before arriving at the zocalo, market central. This is true folk art at its best. 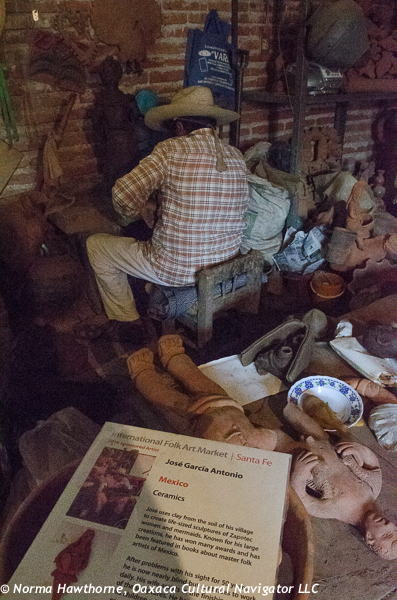 Josefina sits with legs tucked under her on a padded blanket in the courtyard of her home and sales area forming figures out of soft clay that will later be fired in a kiln that may not reach more than eight hundred degrees. Grandchildren dart around playing with kittens. 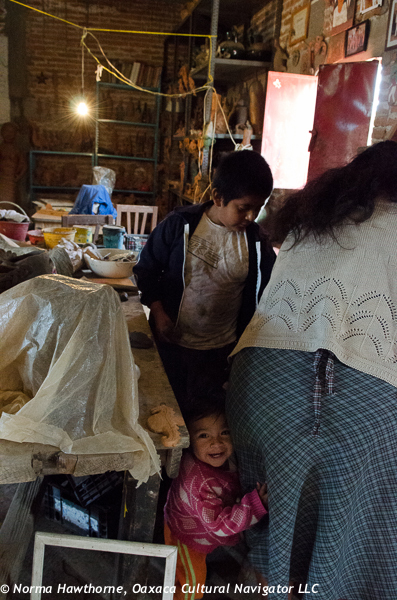 Sons and daughters participate in the clay forming and painting. Tourists from all corners of the earth stream in and out. 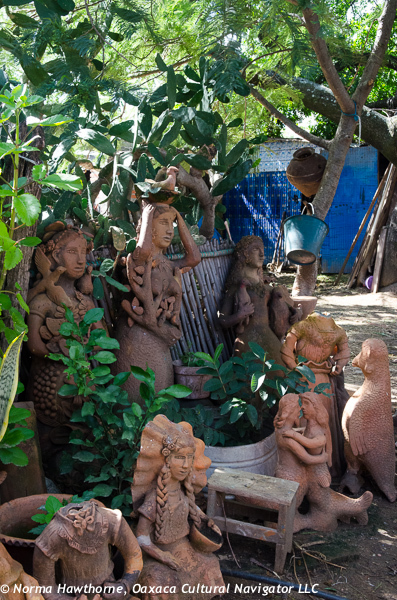 This is a famous stopping place for collecting Oaxaca art, yet the prices of the pieces match the humble working and living space: smaller figures range in price from one hundred and fifty to two hundred and fifty pesos. That translates from about twelve to twenty dollars each. Collectors and dealers buy, pack and resell these figures in the U.S. for triple or quadruple the cost. Next door, sister Irene sculpts hot women of the night and paints their hair yellow, applying blue glitter to create a dress, bosom prominent, one arm on hip, the other akimbo sporting a cigarette, a snake boa wrapped to cover cleavage (just barely). Imagination flies. A muerta, not yet painted, bares her skeletal teeth and she flaunts a haughty lilt of the head topped with a wide-brimmed hat to shade her from the strong sun. How will I get these home? I ask myself as I consider a purchase. Oh, don’t think about it, I answer silently. Go for it anyway, and I do, and because of my magic packing suitcase, everything arrives undamaged. My prize possession from Guillermina is a skeletal crone whose flowing dress is painted black. The hem is adorned with cream colored skulls, a red spider crawls along the folds of her skirt, a black shawl frames the sinister face. Dia de los Muertos is characterized by underworld forms. Forgive me if I repeat myself. 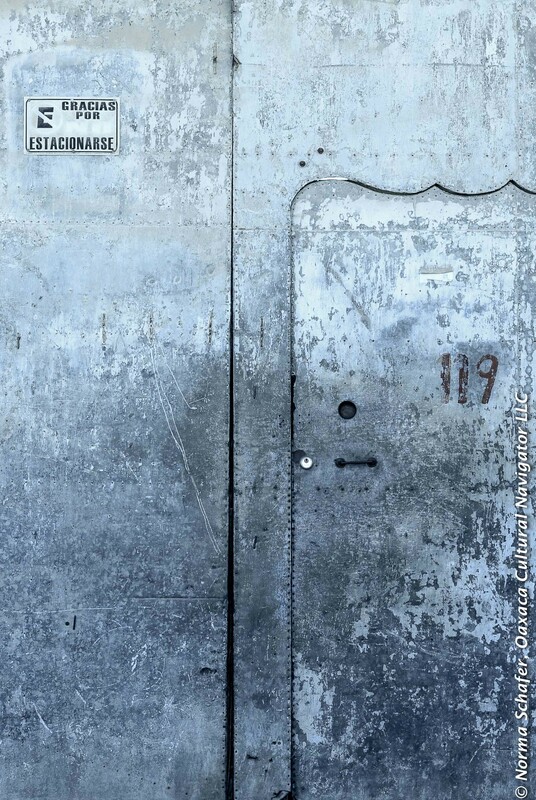 The impressions of Oaxaca are continuous revelations in memory. As we head back out of town, we make a left turn almost immediately onto the side road leading to San Antonino, where I want to relocate Don Jose Garcia, the blind potter. 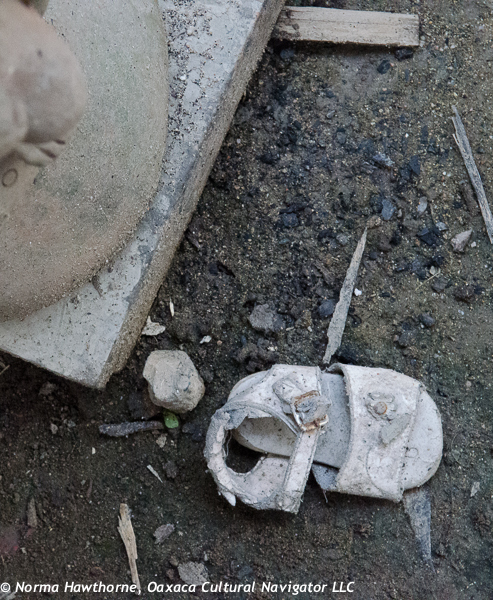 We go down a ways, turn right, make an immediate left at the next street and look for the clay animals that hang over the door to the courtyard that signals we have arrived. A dog barks. The door is ajar. We ring the bell and step inside to be welcomed by the family. Life-size clay figures cluster around the patio, are tucked haphazardly into corners, are laying on their sides — humans, animals, children. 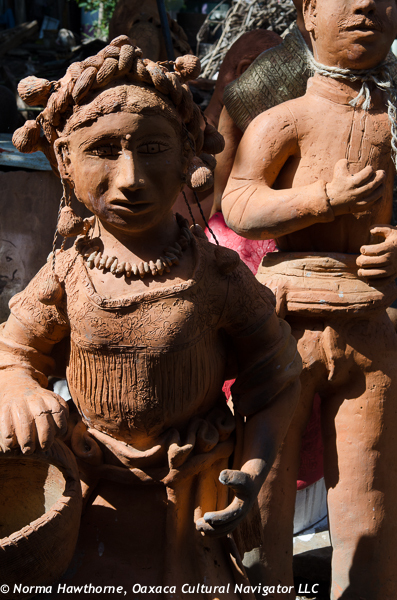 We are greeted by Don Jose and his wife who guide us into the workshop packed with more sculpture, wall to wall, like the clay soldiers of Xian, men, women, and children stand or kneel side by side, almost alive, waiting to be adopted and taken home. These pieces are glorious, primitive, raw clay, unglazed. Some are rough. Some are polished. Each with a unique expression that conveys individuality and personality, a special quality that Don Jose has breathed life into as he forms the clay, braids the hair, fashions the nose, tilts the neck, arches the brow or mustache. These are heavy pieces, primitive. To ship them would require a crate and an investment of hundreds of dollars. We admire and take our leave. Hungry, our next stop is at Azucena where Jacobo Angeles operates a fine restaurant that caters to tourists and tour buses, Elderhostel, and other forms of non-adventure travel. 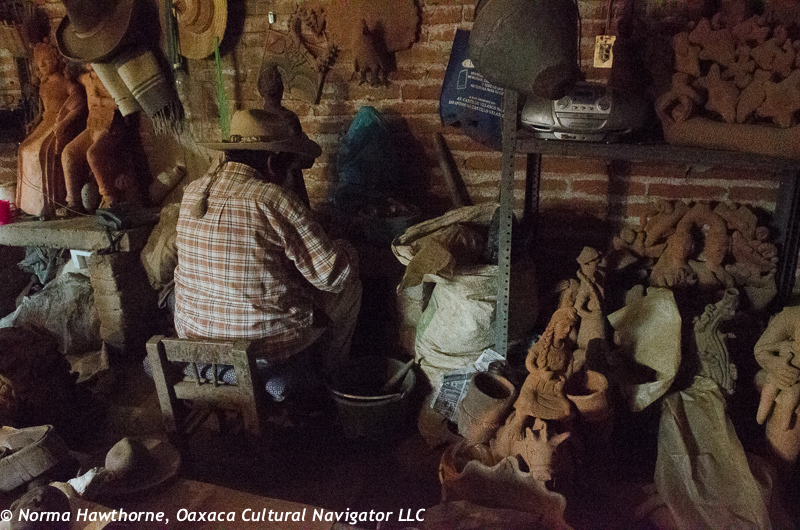 This is good for San Martin Tilcajete business, since Jacobo represents many of the finest carvers in the village. 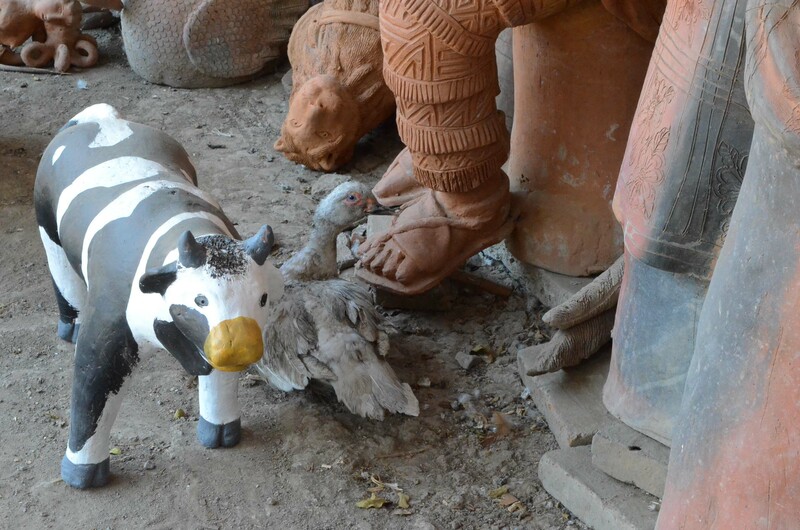 On this day, there is a special exhibition of regional folk art on the grounds of the restaurant and gallery, a perfect opportunity to pick up another carving, to eat and drink well, and to make a necessary bathroom stop. We backtrack to Santo Tomas Jalieza to visit Abigail Mendoza and her family at Nicolas Bravo #1. On backstrap looms, they weave fine cloth with intricate figures that are fashioned into handbags, belts, wrist bands, table runners, and placemats. Abigail does the finish work for the rugs woven by Arnulfo Mendoza and Tito Mendoza. 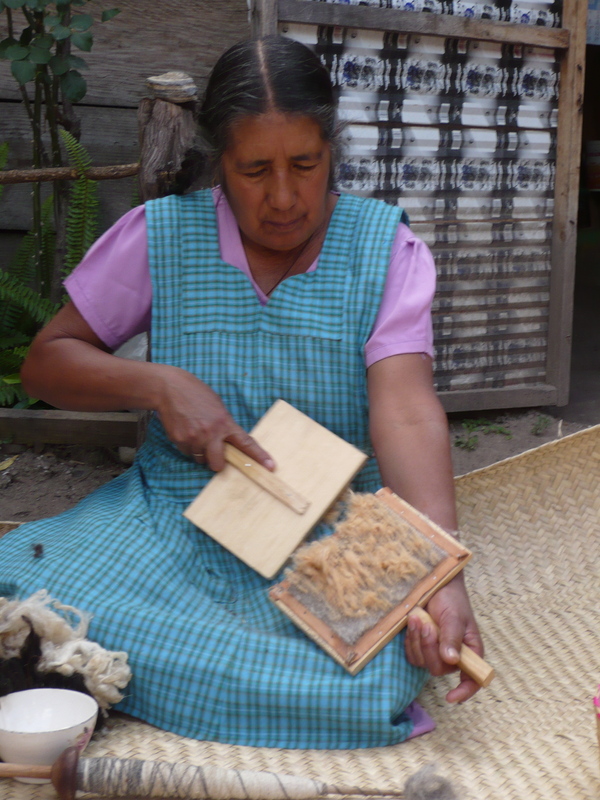 This is among the finest quality backstrap loom weaving you will find anywhere in the Oaxaca valley. By now, it is five o’clock in the afternoon and the light is beginning to wane. We travel along the highway back to Oaxaca with a trunk full of goodies, ready for a fresh mango margarita and guacamole at La Olla. Descanse. San Baltazar de Chichicapam is a hill town nestled in the Sierra Madre del Sur about midway between Tlacolula and Ocotlan de Morales and requires the better part of a day to get there. 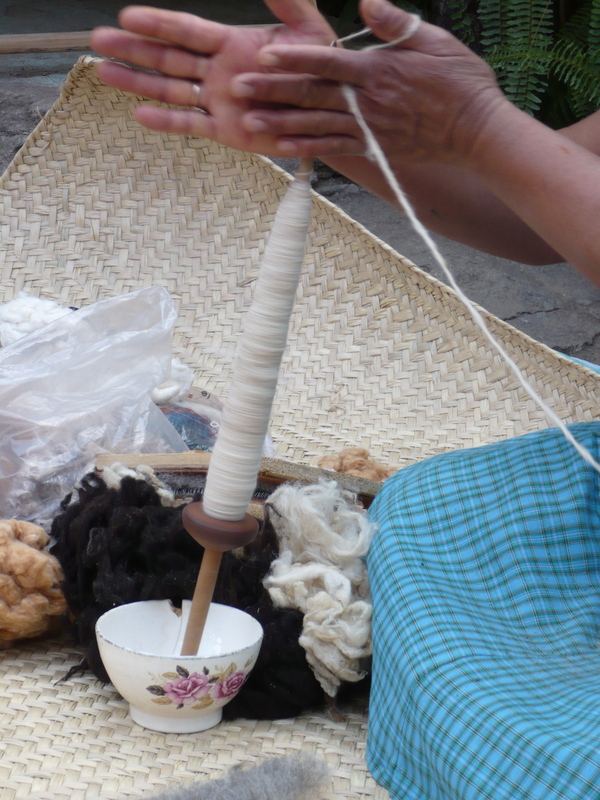 The village is noted for its fine, hand spun wool created in the traditional method by women using the drop spindle or malacate. 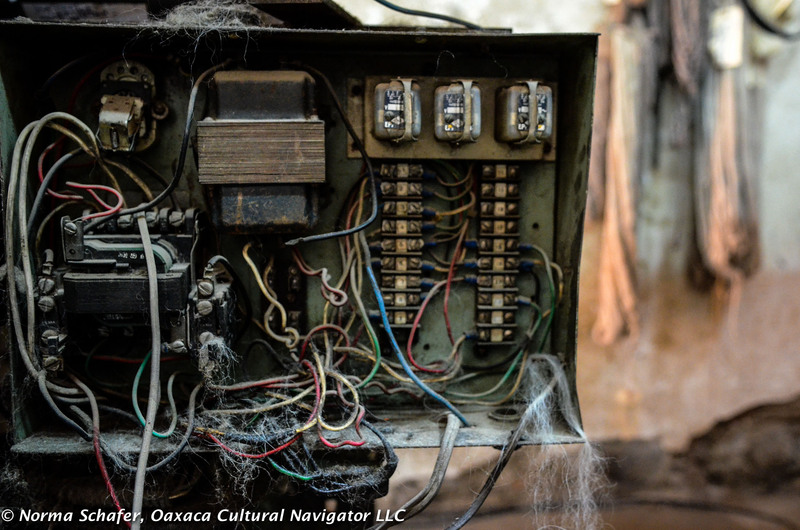 [It is also known for producing some of the finest mezcal in Oaxaca.] The best of the best traditional spinners is Yolande Perez Vasquez who has been recognized by Mexico as a national treasure. I met Yolande a couple of weeks ago at the Friday night art opening at La Olla where the wool she spun and dyed with natural plant materials was used in the tapestries woven by Tito Mendoza and designed by Lisa Cicotte. She was sitting along the wall in the back of the courtyard, a beautiful, regal Zapotec woman. I didn’t know her or her role in the process then, but her presence drew me to her and I introduced myself and we talked some. I discovered that her hand was integral to the art I was looking at and essential to the traditional process of weaving. I asked if I could come to visit her at her home sometime and she agreed. 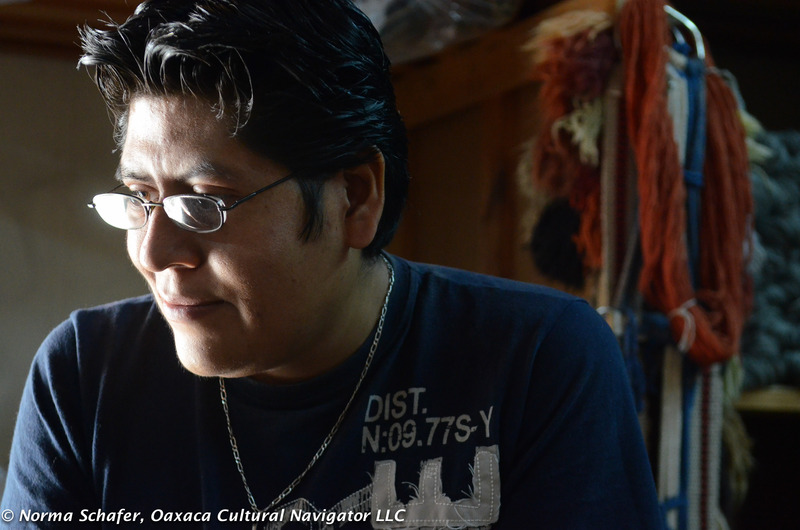 We approached Chichicapam from Ocotlan because we had gone to Oaxaca first to pick up my friend Eric Chavez Santiago, the director of education at the Museo Textil de Oaxaca. His father, Federico was driving, and Sam and Tom Robbins, my photographer friends from Columbus, Ohio, were with us. 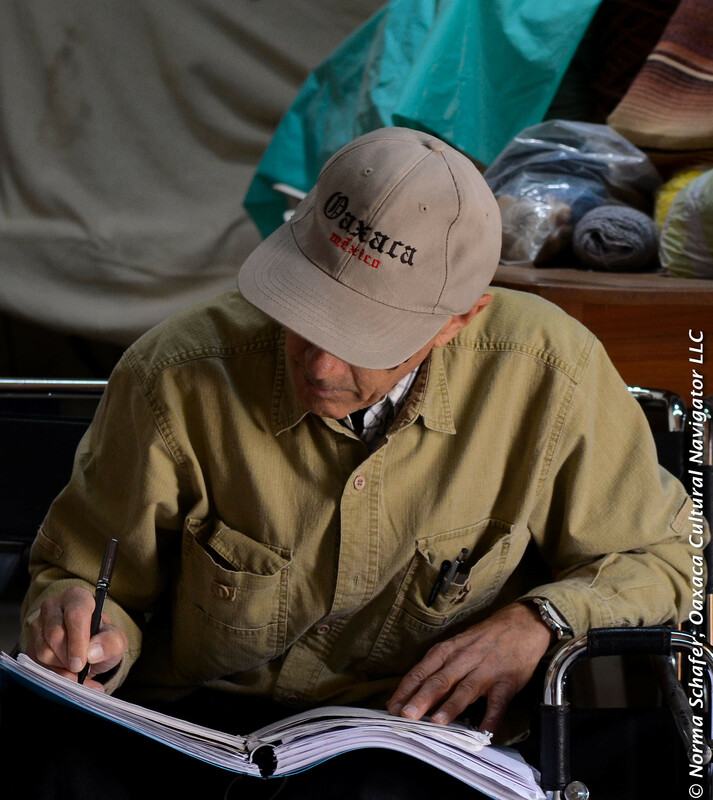 Federico has been buying his handspun wool in Chichicapam for as long as he has been weaving (at least 40 years) and knows how to get there. The road from Ocotlan to Chichi is 22 km and is not well marked at the source. There is some winding around city streets to find the route, so this is not an adventure you want to take lightly. We climb into the rolling hills, passing the village of Santa Catarina Minas. Farmers are carrying huge bundles of dried cornstalks on their shoulders, the last of the harvest. A man pushes a wheelbarrow along the road filled with plastic tubing. King sized cloud pillows float in the clear blue sky. Sheep graze along the base of a mountain peak. Bamboo pillar fences border a dirt side road. As the road climbs, the terrain shifts to mesquite, organ pipe cactus, white flowering yucca, agave and herds of goats. We pass over Puente Rio Lodo. Trees give forth lavender and violet flowers. Burros carry firewood. A turbaned cow herder stands by the side of the road with long pole in hand. Her cows are grazing on a hillock nibbling on dry grasses. She is sucking on sunflower seeds and spits husks as we pass. The landscape is vast, dry, endless. We are in the bosom of the Sierra Madre del Sur. Yolande Perez is age 65. She learned from her grandmother when she was 8 years old. 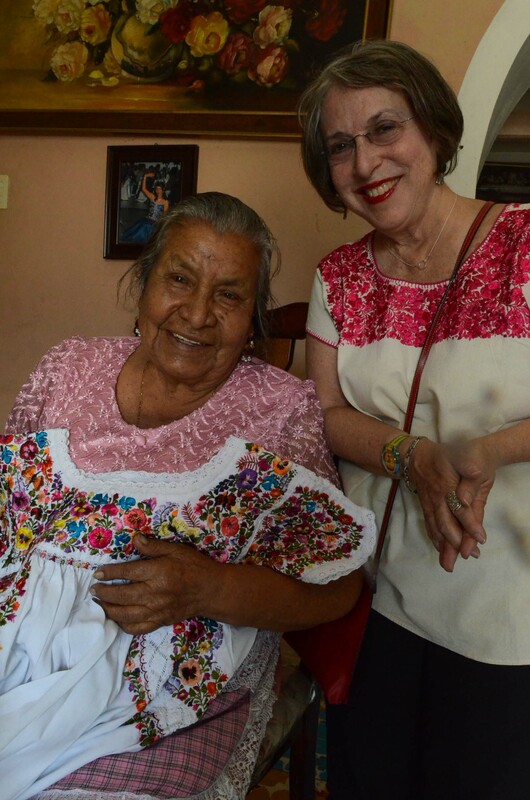 Her grandmother spun and wove ponchos which she sold in the Ocotlan and Tlacolula markets and used in the early Guelaguetzas. 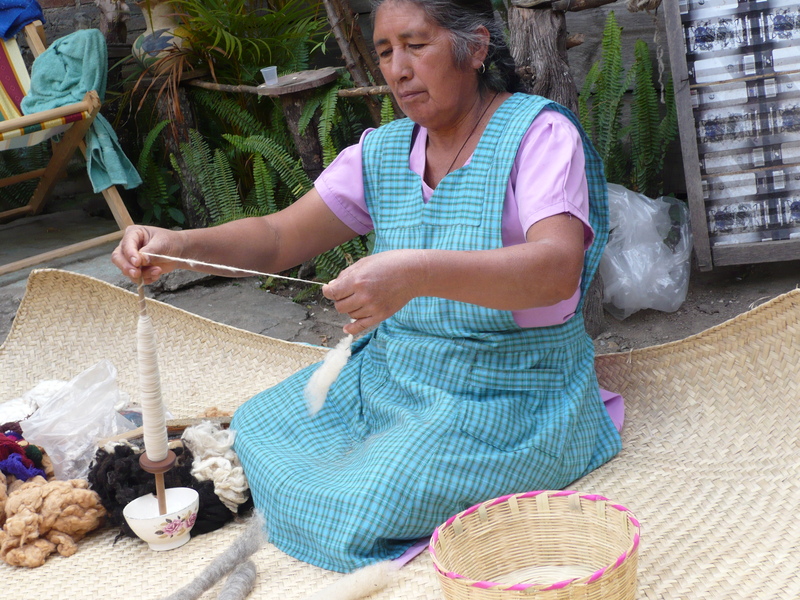 In 1970 Yolande formed a group of 400 spinners from the village who sold their wool to Teotitlan weavers. Those were the prosperous years. 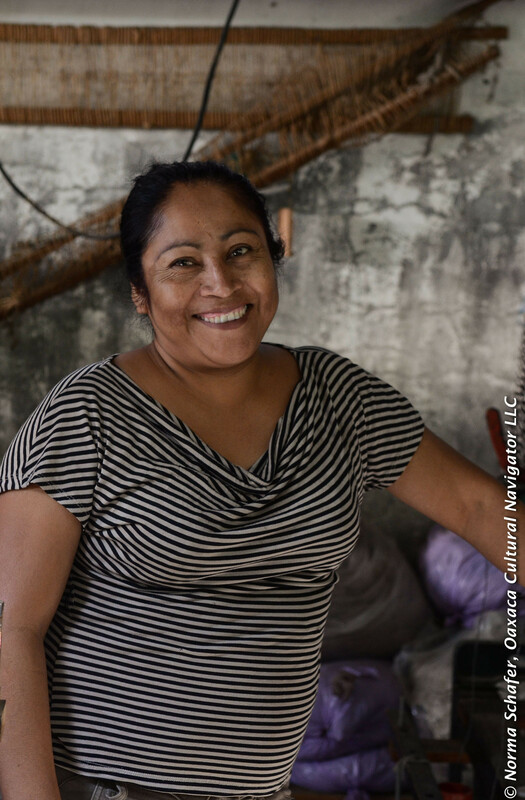 She and others were invited to national contests and to show their work in Mexico City, invited by the president, along with other noted pottery, weaving, and textile artisans. Yolande and her son San Juan say that not much financial benefit came from these showcases and they have felt exploited. Today, much of the wool that most weavers purchase is commercially spun because the price is less. Weavers are using chemical (aniline) dyes because the tourist market demands lower priced goods. The dye plant materials that Yolande grows in her garden or picks from the campo and the process to make tintas naturales to color the handspun wool is not appreciated or valued by most consumers. 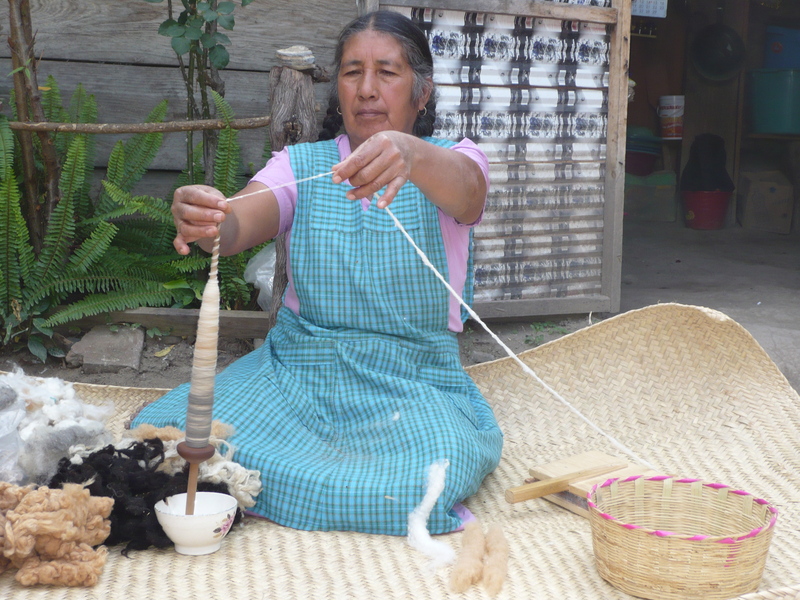 There is little if any recognition for her role or the role of other traditional spinners or even the citing of the Chichicapam pueblo as being part of the process of creating a fine wool tapestry. 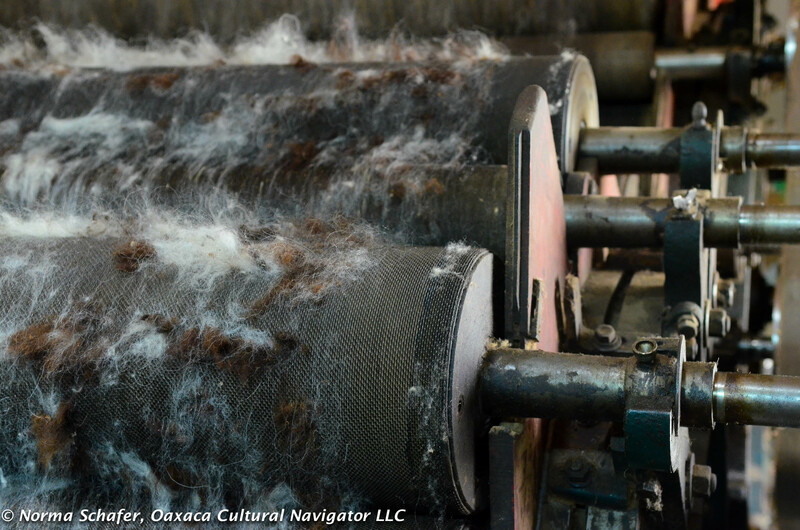 Most weavers in Teotitlan claim that they do all the production steps. We are invited into the adobe complex. The kitchen walls are lined with turquoise enamel cook and dye pots. The floor is soft, spongy adobe. A large wood work table is centered in the room. There is the remnants of a wood fire under the comal in the corner. Yolande, a daughter tells us, does not want to upgrade the kitchen. She likes the traditional way of life. We move to the courtyard under the arbor. A dump truck filled with dried corn husks backs in almost on top of us and begins to spill its load, an avalanche of corn is deposited at our feet. The family will husk each cob and pick off the dried kernels, basket them and take them to market for extra income over the winter months. The husks are pale yellow tinged with purple. Yolande’s garden is filled with plants and flowers, a shady arbor, and a pen in the back that holds two sheep and a newborn lamb. The goats have been shorn for their fleece which is piled and ready for spinning. Yolande lays out a handwoven grass mat, pulls out her handmade wood malacate (drop spindle), and demonstrates for us the technique of handspinning coyuche (natural brown) cotton, locally cultivated silk, cotton, and wool. She cards white and black wool together to show us how she achieves a soft grey color. She spins the malacate and gently pulls and coaxes the thread out with her other hand and the thread is consistently even and pliable. 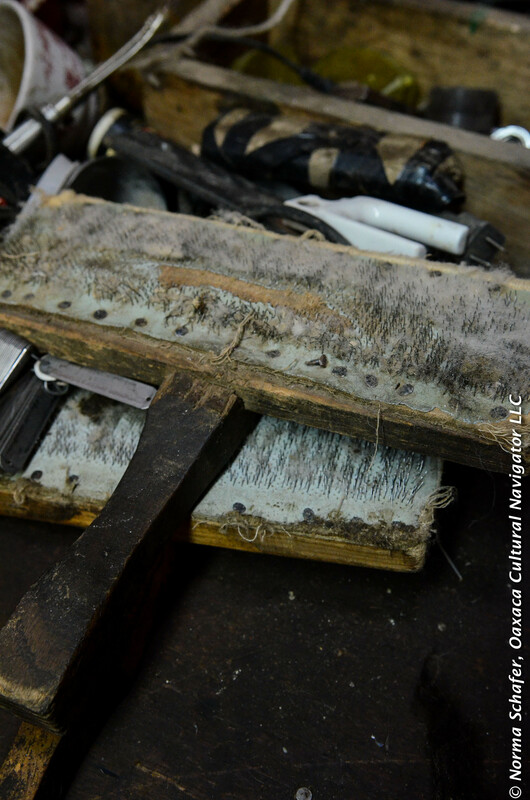 Hers is the first essential step in the weaving process. 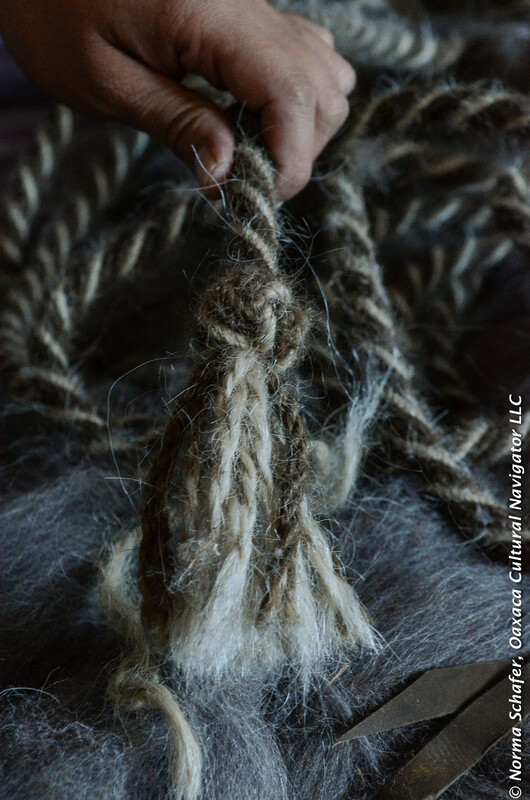 Without fine handspun wool there can be no rebozo, poncho, or tapete, and her work is that of an artist. The women’s spinning cooperative is no longer in existence since commerically spun wool is what most weavers are buying. Now, Yolande tells us, there are a few young women in the village who are learning to use the malacate. I wonder how long this tradition will continue. Some of the weavers say they don’t like the colors of naturally dyed handspun yarn because they are softer and more subtle. The marketplace drives demand, I remind myself. 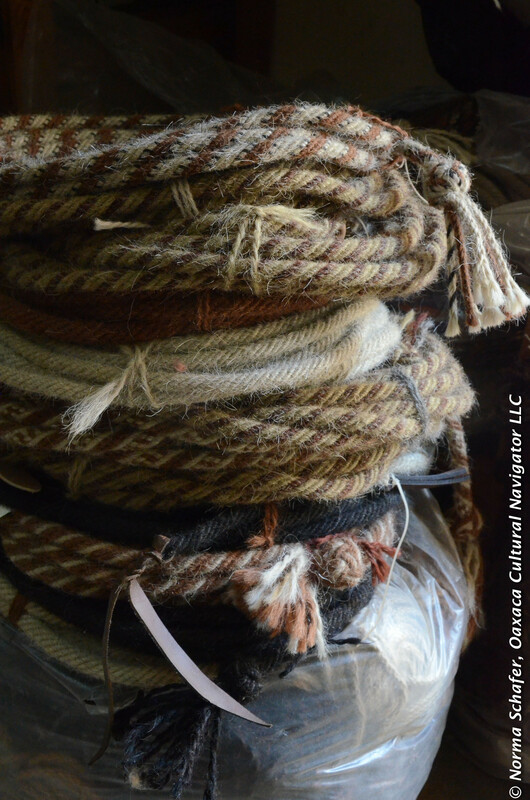 If people know about and appreciate the craft and artisanry that goes into creating a fine woven textile, perhaps there will be a resurgence and compensation for people like Yolande Perez Vasquez and my weaver friend Federico Chavez Sosa or the 200 weavers commissioned by Remigio Mestas to create authentic, naturally dyed textiles. The cost is double, but the handwork is extraordinary. 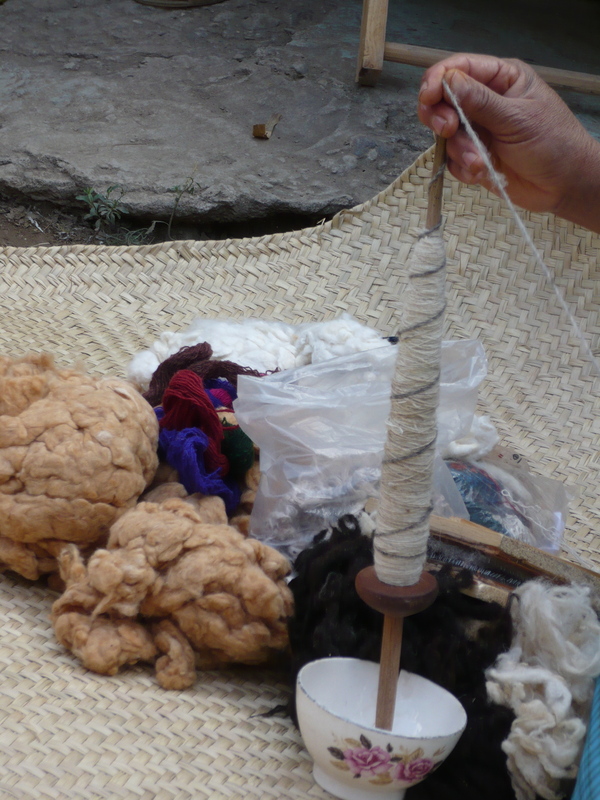 There is a possibility that Yolande will come to the Museo Textil de Oaxaca to teach and demonstrate. She has participated in so many programs over her lifetime with little recognition or compensation that she wants to know more before she will make a commitment. Eric understands this and because he comes from a family dedicated to preserving the traditions, he will do his best to give Yolande the visibility, recognition and compensation she deserves. After toasting each other and the future with shots of mezcal in the coolness of the family altar room, we leave and head back to Ocotlan. The visit was over two hours but definitely worthwhile.